Assuming my dynamic DNS, home Internet link, home web server, and the NTP server itself are all up and functioning, the following is the current live status web page of my NTP server. You'll need an SVG capable browser such as Opera, Firefox or a very recent Safari. Older Safaris and Internet Explorer require the Adobe SVG viewer. Typical accuracy seems to be about ±10ms. Requires a pulse-per-second signal from the GPS. PIC18LF4620 (clocked at 25MHz from ENC28J60, 6.25MIPS) - 64KiB Flash, 4KiB RAM, 1KiB EEPROM. DS1305 Real Time Clock. This isn't needed - it's present because I'm using the same circuit board design in another project. 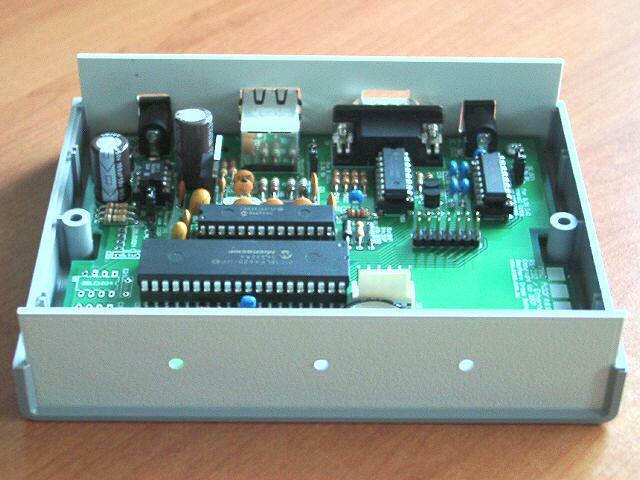 MC34063 switch-mode (5V) and LM3940 (3.3V) low drop-out linear regulator (power supplies). SMB (Samba, or CIFS) time of day protocol. This is useful for computers without NTP support, such as Windows 95/98/ME/NT/2000, and you don't want to bother with third-party software. Telnet Com Port (RFC2217) (for access to the NMEA data stream from the GPS receiver). This is been removed to make room for the SMB time protocol. Web-based monitoring and configuration, password protected. PLEASE NOTE: The CCS port of the Microchip TCP/IP stack is copyright by CCS and not allowed to be re-distributed. If you want a copy, you can download it from CCS, provided you have download rights. You may need to purchase a maintenance agreement from CCS. Requests or discussions to me for copies of the CCS TCP/IP stack will be ignored. VCC1 and C21 on the DS1305 are shown connected to the +ISO rail. They should be connected to the +5V rail. Each of the EEPROM sockets needs a 10K pullup resistor on the CS line if a chip is to be actually installed in there. I've modified my board to include a DAC-controlled (MCP4821) VCXO attached to U7. The firmware will work fine without it, but don't use U7 unless you remove the DAC interface code. I've added a 4-digit 7-segment LED display board to U8, controlled using a 16F88 as an SPI slave. The firmware will work fine without it, but don't use U8 unless you remove the clock display update code. I've installed an MCP25AA020 EEPROM on U10 to store the Ethernet MAC address (for future compatibility with the MCP25AA02E48). If you want to do something different, you'll need to replace the initialisation code appropriately. The PPS from the GPS needs to go through the MAX3232 so the correct logic level gets to the PIC. However, there was no easy way to generate the necessary interrupt from the pin I'd routed it to on the PIC. My solution was to cut the WOL from the ENC28J60 (which wasn't used anyway) and route the PPS to the corresponding interrupt pin on the PIC (RB1/INT1). If you're looking for schematics and PCBs for the DAC/VCXO and LED display - they don't exist! I cobbled them together using prototyping board. In the middle of 2007 I upgraded my Linux server box from a 486DX2/66 to a 1GHz Athlon. That old box had been sharing my Internet connection, files, a dot matrix printer, emails, and acting as a time synchronization server. As well as upgrading to a faster box, I also upgraded from a simple ADSL modem to a modem-router, ditched the printer, shifted mail-handling responsibilities back to my ISP and also intended shifting the file sharing to a dedicated hardware NAS device, but that last item ran into some technical difficulties. That left just the time synchronization, and while I could have just duplicated the old setup, I thought it would be nice to have a bit of dedicated hardware for that, too. There were some other incentives too. I'd recently got into microcontroller programming with Microchip PICs, and a future project was going to need Internet enabling. I felt I should get some experience before tackling that project and a NTP server seemed the ideal way. Testing has shown that this design is usually accurate to within ±10ms, but is sometimes ±100ms. It would be more consistent if I used a decent GPS receiver (more details below). If you're interested in something more accurate, and/or don't or can't build something like this yourself, you can purchase similar off-the-shelf devices. For example, TimeTools. I started with Microchip's ENC28J60 Ethernet Interface chip. This is a fabulous chip, available in through-hole packaging making it easy for part-time electronics folks like me to handle. Then I upgraded my CCS C compiler to their version 4 and grabbed their TCP/IP library. The next step was selecting a PIC micro. I initially selected an 18LF2620 and prototyped with that, however, it turned out that I needed a couple more I/O pins than were available, so I switched to an 18LF4620 and later an 18LF4685 as additional features consumed firmware memory. The Ethernet and TCP/IP support alone is just under 32KiB! My prototype has found a second life as a UPS monitor. The board is intended for re-use with a future project, so there are some extras that the NTP server doesn't use, such as the four external Flash memory sockets around the left of the micro, and the 14-pin expansion header. Below the micro is a DS1305 real-time clock (and 1F super cap for backup power). They aren't strictly required either, but they allow the time server to keep time without the GPS receiver, and will be required in the future project. My first prototype used a 7805 linear regulator, but since the power supply is powering the GPS receiver as well as the server, it got a bit too hot (90°C) even with a heatsink. The switch-mode power supply runs at a more modest 52°C. The front of the server is a green power LED and two red/green bi-colour LEDs for status. The middle status blinks every time an NMEA GPRMC message is received - green when the location data is valid, and red when it isn't. The right status is usually on, green to indicate when the server has synchronized with the GPS receiver, and red when it hasn't. The right status blinks off whenever a packet of any sort of time data is transmitted. The interface to the GPS receiver is via the serial port. A five-way cable carries power, ground, data in, data out, and the PPS. When I originally bought my GPS receiver, back in 2000, it performed quite well. Since then, it's degraded noticably. It can now take several hours to get a position lock, and readily loses lock. Being on a window sill (it faces south), it doesn't have the greatest view of the sky, so that could be part of the reason. Another part can be seen by comparing the satellite data on the status page with the current GPS satellite positions (I'm located in Perth, Western Australia). Satellites are out of position, there are extra satellites where there shouldn't be any, and missing satellites where there should be some. I'm wondering if there isn't a bug in the firmware, and/or something has slightly changed in the GPS communications that the old firmware can't handle. To work around these shortcomings in the receiver, I installed a DAC-controlled VCXO. This allows the oscillator to be calibrated to the PPS with an accuracy of about ½PPM. That enables the clock to stay accurate between GPS position locks, which could be hours apart. Documentation on the NTP protocol is readily and freely available. In particular there is the web site of David Mills, the original designer of NTP: Network Time Synchronization Research Project. In particular, the Reference and Implementation Guide PDF is highly recommended reading. The requirements for my server are very simple. 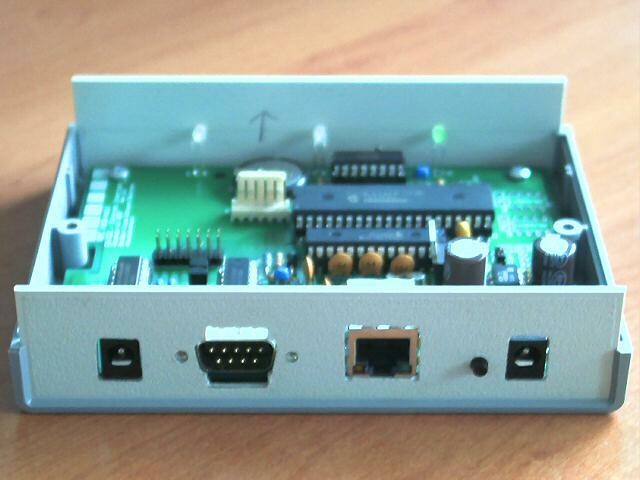 It only needs to synchronize with the GPS, and does not need to synchronize with any other NTP server. Much of the complications of NTP involve NTP clients synchronizing with NTP servers (which includes lower-stratum NTP servers synchronizing with higher-stratum servers). Without that complexity, all my server needs to do is transmit the current time as it sees it. That means that I only had to deal with the first 48-bytes of any NTP UDP packet received. Any other bytes are ignored and discarded. The replies back to the client are the same set of 48-bytes, modified appropriately. NTP Time Formats, when representing a date, is the number of seconds from 00:00:00 1 January 1900 UTC. Poll 8 bit signed integer representing the maximum time between successive messages in log2 seconds. Typical poll values are between 6 and 10 (64 and 1024 seconds). Precision 8 bit signed integer representing the precision of the system clock in log2 seconds. For example, -18 corresponds to about 1 microsecond. The NTP server will be sent a UDP packet formatted as above. My server only processes the Mode and Transmit Timestamp fields. LI: set to 00 or 11 depending on if the clock is synchronized to the GPS. Mode: If the original was symmetric passive, changes it to symmetric active, or if the original was client, changes it to server. Other values cause the received packet to be ignored (no response). Poll: set to 10 (1024 seconds, or ~17 minutes). Precision: set to -10 (~1ms) (internal timer has a 1ms tick). Root delay: 1 second (0x00010000) (GPS update rate). Root dispersion: 0.5 seconds (0x00008000) (i.e. should be within 0.5sec of GPS time). Reference timestamp: set to the current time. Originate timestamp: set to the Transmit timestamp of the original packet. Receive timestamp: set to the current time. Transmit timestamp: set to the current time. I had my PCBs made by Futurlec. Their prices are excellent, as is their board quality. I've only gone for their double-sided, soldermasked, and silkscreened options so far (they look so nice! ), but they do offer cheaper boards without the soldermasks and silkscreening. However, for both of my orders so far I've had to wait a month from placing the order to getting the boards. 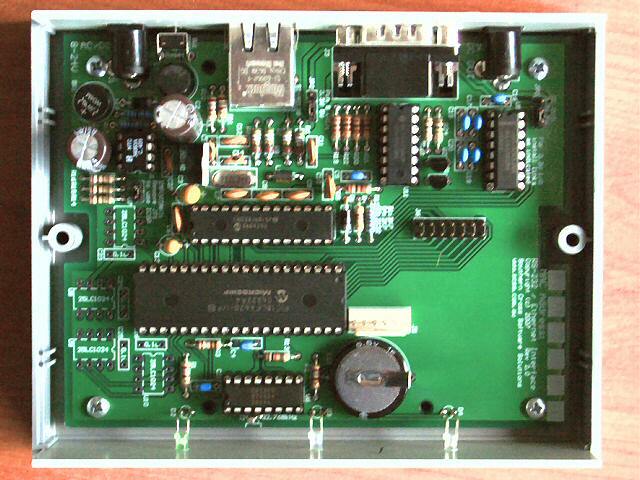 In order to use Futurlec, you need to use Protel to do the PCB. Luckily, I have access to Protel. If you don't have access to Protel, I found the software from ExpressPCB to be very easy to use, although you are then forced to manufacture with ExpressPCB. The only major thing missing was verification that the PCB design matched the source schematic. Apart from that, it did everything I wanted. I never used their PCB manufacturing service. The only comment I can make, is that it looks at least twice as expensive as the Futurlec prices, which to be fair, is probably due to the incredibly fast turnaround times ExpressPCB promise. Maybe it's just my computer, but I've found the Internet Time function of Windows XP to be quite unreliable. It's sometimes very difficult to get it to sync with my server. In comparison, Time Tools NTP Server Monitor was able to regularly poll my server without any problems. To add extra time servers to the Internet Time list, you need to go to the registry key HKLM\SOFTWARE\Microsoft\Windows\CurrentVersion\DateTime\Servers and add your new time server FQDN or IP address (just give them the next numbers in sequence as their Names). You can set the Data of the Default value to one of your newly added servers. To change the update interval from the default of once per week, go to the registry key HKLM\SYSTEM\CurrentControlSet\Services\W32Time\TimeProviders\NtpClient and change the Data of the SpecialPollInterval. The value is in seconds. The default (one week) interval is 1 week = 604800 seconds. A 1 day interval is 86400 seconds. Coding on microprocessors is often quite challenging - especially trying to get all the functionality you want into the available memory. All the web pages in my server are stored in the internal program EEPROM, and making the code as small as possible was very important. However, just as important, was to ensure all the code emitted was valid. Since I was using tables to lay out configuration forms, that implied the use of HTML 4.01 and the corresponding long DOCTYPE. Still, I was able to arrange the code so that the DOCTYPE only appears once in the program. For the rest of the HTML I studied the DTD and found that quite a bit can be trimmed off while staying valid. Some people have asked about the cost of all this. All up, it has cost me quite a bit, as I bought many of the more unusual parts at low volumes through rather expensive electronic component suppliers. Keeping to low volumes, but using more economical (but less convenient) suppliers, the total parts cost of one unit comes to about AUD$120. About one third of that is just the PCB. An external plugpack and cables are additional. NTPmonitor - This software shows a trend plot of the servers it monitors. Time Tools NTP Server Monitor - This software doesn't show a graph, but simply reports round trip and offset values, and can optionally set your PCs clock. Lots of acronyms there! In short, this would allow SNMP management and monitoring of the server. However, as at October 2008 the MIB is still in draft, and it could be many months before it is ready to be implemented. This seems to be the standard Linux way of sharing GPS data. The protocol looks fairly simple, but I'd have to add code to parse the GGA and GSA messages. It would be really nice to be able to support firmware upgrading through the web interface. However, that would require enough external storage for a temporary copy of the firmware, plus the extra processing code to handle the upload, checking, and bootloader to reprogram the PIC. This would require at least one, probably two, external 64KB EEPROMs. Last updated: 2009-07-29. Copyright © 1999-2019.